Author Jane Austen wrote to her sister Cassandra in a letter dated 16th September 1813 ‘We then went to Wedgwood’s where my brother and Fanny chose a Dinner Set. 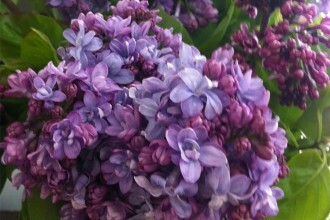 I believe the pattern is a small Lozenge in purple, between Lines of narrow Gold and, it is to have the crest’. Jane already owned a set of Wedgwood china herself, evidenced by a previous letter to Cassandra on the 6th June 1811 where she describes unpacking her order. The china had been made by England’s trend setting potter, manufacturing innovator and marketing genius of the second half of the eighteenth century Josiah Wedgwood (1730 – 1795). He said “Beautiful forms and compositions are not made by chance, nor can they ever, in any material, be made at small expense. 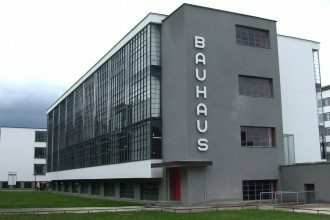 A composition for cheapness and not excellence of workmanship is the most frequent and certain cause of the rapid decay and entire destruction of arts and manufactures.” His name became well-known for quality and excellence, as a well as a generic term for the style of fine stoneware that he produced. By the end of the Regency period (1714 – 1830) in England the country was in the grip of ‘china mania’. It was fuelled by the passionate pursuit of eager enthusiasts rampaging through the antique shops of England and Europe endeavouring to turn up lovely ‘old china’ and, most especially pottery by Mr Josiah Wedgwood, the so-called Prince of Pottery during the second half of the eighteenth century. Josiah Wedgwood (1730-1795) was a man of humble birth who rose to become a national figure and one of the most celebrated and influential artist craftsmen of his time. He also became one of the eighteenth centuries foremost entrepreneur’s, applying himself “to the important work of uniting art with industry”. 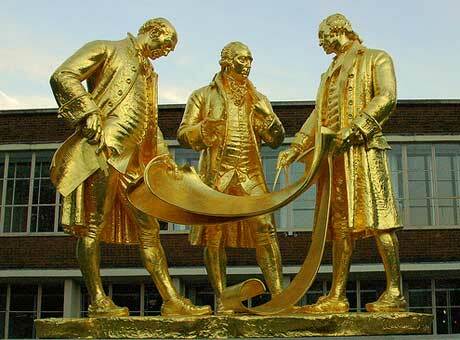 Josiah Wedgwood’s is an incomparable rags to riches story. He started as a tradesman with £10 and ended his life a tycoon worth £500,000 + a huge sum in 1795. An acutely ambitious man, Josiah Wedgwood built his very stylish pottery business against often harsh physical and fierce political and economical odds. He lost a leg in the process, but it failed to slow him down. He correctly courted public taste for the Neoclassical style, which was being developed and promoted in architecture and interior design during the last forty years of the eighteenth century by such leading lights as London based Scottish architect Robert Adam and his rival English architect James Wyatt. Josiah Wedgwood knew all about marketing’ and promotion long before it became a science, his knowledge coming out of a wealth of experience. 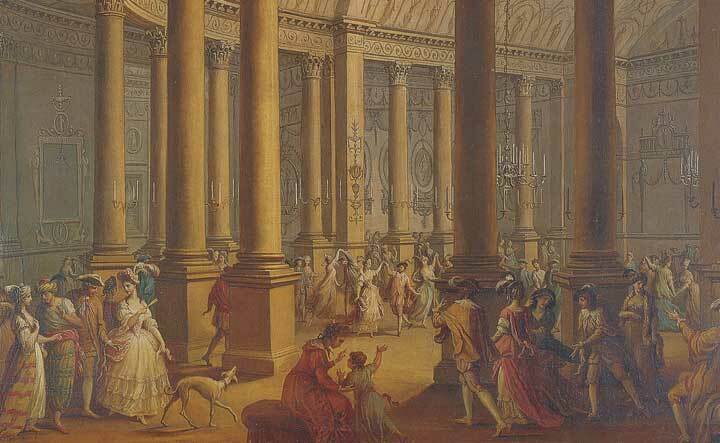 During Wedgwood’s time the fashionable enjoyed great assemblies, gaming and balls, which were highlighted by Jane Austen in her novels. 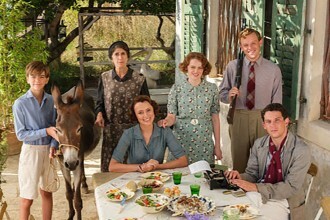 A house that came to life at night enhanced the ‘gaiety of their lives’. A dining room was considered an essential reception room. 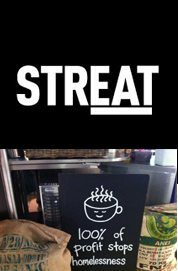 It was used for informal meals, as well as for private business conducted by the owner. Often elaborate late night suppers took place in purpose built pavilions, designed by Robert Adam, such as the one for the Earl Of Derby’s ‘fete champétre’ held in 1774 – Large vases in niches and superb cameo style medallions installed above the fireplace were important design elements of the neoclassical style. The pavilions were set in gloriously landscaped gardens. After refusing to work with his brother, in 1754 Josiah Wedgwood entered into a five year partnership with James Wheildon who, from 1740 – 1780 was one of the foremost potters manufacturers of his day. At Whieldon’s works Wedgwood put in place, what he called his ‘experiment book’ , which detailed the different methods and techniques he developed that helped Whieldon achieve his place in the trade. He invented a ‘new green earthenware’ that reputedly had the smoothness and brilliance of glass, was of excellent quality and with good shapes that were exceedingly well made. After his five year contract Josiah Wegwood left Whieldon because he wanted to perfect and bring to successful issue many of his own experiments. 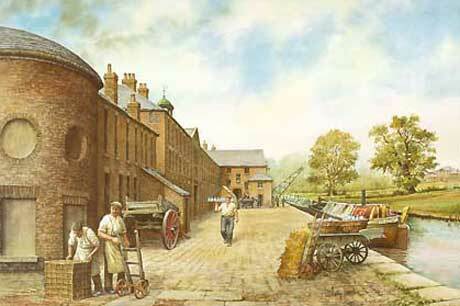 He wanted to become a thoroughly modern merchant and so he set up business for himself at Burslem. He was blessed with felicity and foresight and had gained extensive business acumen and knowledge of arts and crafts during his own time as an apprentice in the pottery trade. He combined all of this experience with a great personal love for the pottery of antiquity. 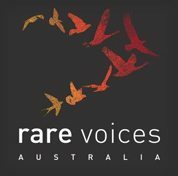 Quick to visualise that in the next century a potential market for glamorous earthenwares would exist, due to the expansion of the middle classes, he set about refining and improving his techniques of manufacture and standardizing sizes so that his goods could be stacked easily. He expanded his colours and glazes and speeded up the process by introducing a division of labor on the production line. By bringing order out of an often chaotic system, he was left free to develop his own ideas. 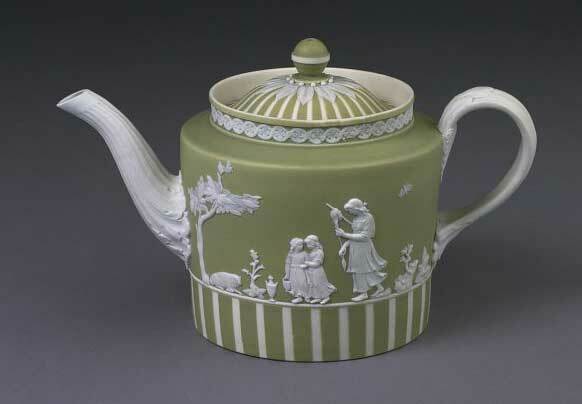 Wedgwood pioneered many new techniques and further developed the tools and kilns of his trade. Engine turning was a pastime performed by gentlemen on wood. He converted and developed a special lathe so that he could produce the look of this refined decoration on his unfired pottery. The lathe was quite unique with an eccentric motion, its movement guided by projections on the wheel (cams) that converted the circular motion of the lathe into a variable motion. He was first to the bench every day so that he could teach those working with him how to make the object in his style. He rang a bell to begin and end the day and his ‘Bell House’ works produced products that gained distinction on the trading markets of both England and on the Continent. 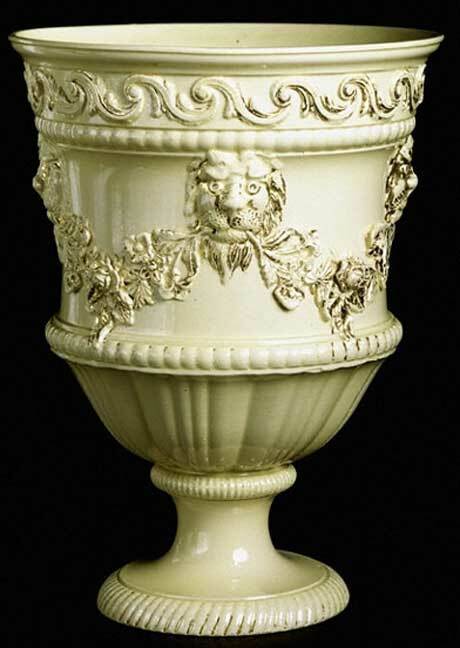 His premier product Creamware was made from a mixture of clays from south west England, and it took him a while to achieve the result he wanted but he had perfected it by the mid 1760’s. 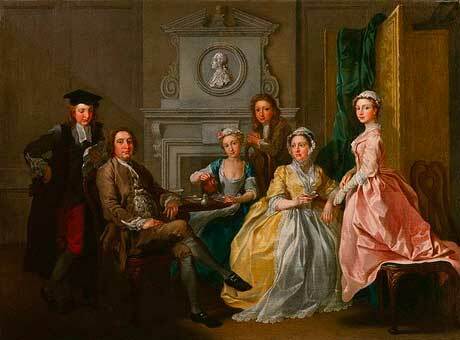 When, in 1765 he became Royal Potter to Queen Charlotte and was allowed to call his cream ware ‘Queen’s Ware’, no one in his celebrity circle of family, friends and colleagues was really surprised. He understood the value of a ‘celebrity’ endorsement and went from strength to strength increasing prices for the nobility so that he could lower them for the burgeoning middle classes. He wanted them to be able to afford some of his ranges, without affecting their status with his aristocratic clients and he did this by achieving a high state of perfection. In 1769 he began a partnership with Thomas Bentley, opening another famous pottery just outside Burslem in Staffordshire. He called it Etruria, after the ancient Etruscan city of that name where lots of ancient pottery had been dug up. 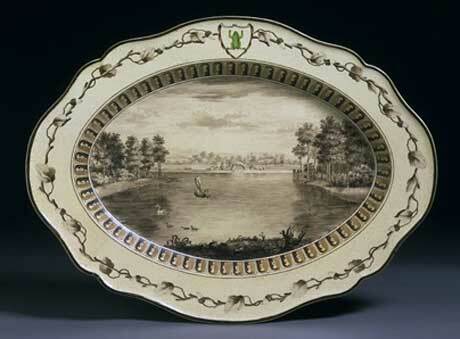 This was when Josiah Wedgwood began to surpass everyone else with the production of unglazed stoneware of all kinds. Sauce boats in particular had become an essential item on the British dinner table around 1720, when French-style sauces including béchamel, tomate, mayonnaise and velouté came into favour. 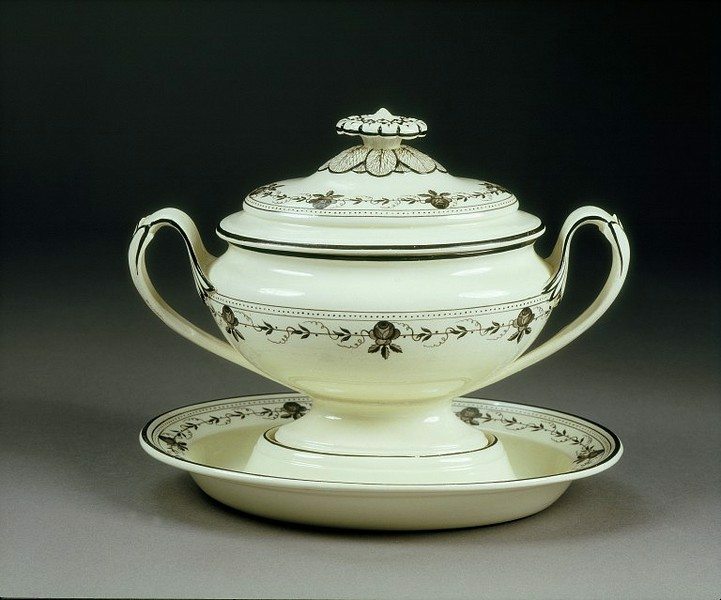 Wedgwood sold his pottery through his London warehouse and Staffordshire factory site and in 1774 his creamware catalogue (available in English and French) listed his sauce boats as being two (2) shillings each wholesale. An accomplished woman Mary Delany (nee Granville) 1700 – 1788 a niece of the 1st Lord Lansdowne recorded in her autobiography and correspondence, which was published in six volumes in 1861 “I have just returned from viewing the Wedgwood ware that is to be sent to the Empress of Russia’ she wrote in 1774. This dinner service became known as The Frog Service. Consisting of 952 pieces all of which were hand decorated with 1,244 hand-painted views of English landscapes, his esteemed client Catherine the Great of Russia purchased it for £3,000. A plate, now in the V & A Museum at London, depicts the fabulous garden at Sir Frances Dashwood’s delightful Italianate country house West Wycombe in Buckinghamsire. 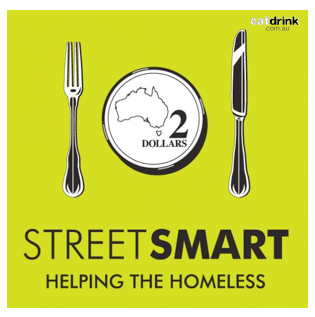 It was meant for serving meat dishes or vegetables and may have also had a domed oval cover to protect the food and keep it warm, which has now been lost. Catherine the Great bought the service for her Gothic styled summer palace, which had been built in a frog marsh outside St Petersburg – hence the inclusion of the frog motif. 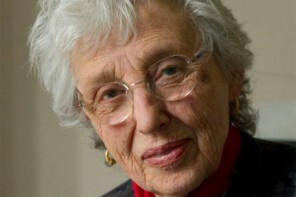 Mrs Delany goes onto say, consists of ‘as many pieces as there are days in the year, if not hours’. The colour of the ground was ‘pale brimstone, the drawings in purple, the borders a wreath of leaves, the middle of each piece a particular view of all the remarkable places in the King’s dominions neatly executed. 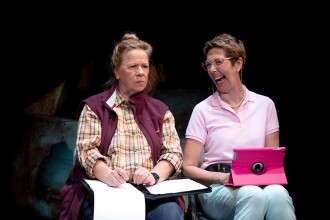 I suppose it will come to a princely price”. She then comments that she is glad if it does because it is all about the ‘ingenuity and industry’ of the manufacturer, who she believed ‘deserves encouragement’. 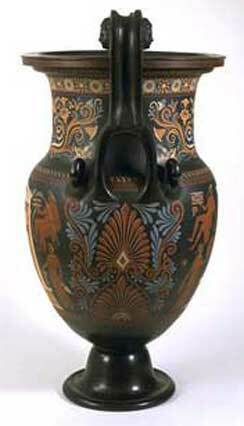 It was at his Etruria factory that he would produce many incredible vases in the ‘Adam’, or neoclassical style. Wedgwood’s vases were his company’s most famous objects and established his company’s fashionable reputation throughout England, Europe and America during his lifetime. Produced in elaborate sets of three, five, seven or even nine, they were commonly set out on mantelpieces with the largest one in the middle. 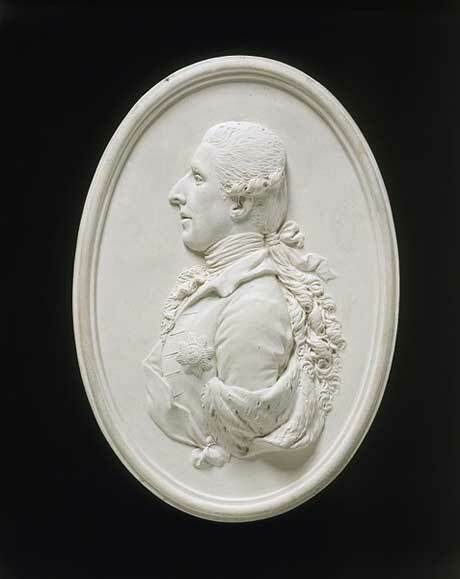 Sir William Hamilton (1730 – 1803) was the subject of a medallion produced at Wedgwood, because he was a high profile diplomat. He produced these mini celebrity snapshots in pottery because collecting cabinets of medallions was a very fashionable pastime. Our black and red vase copies the style of one made four centuries before Christ in the Greek taste and in William Hamilton’s collection. It is a Krater, which was a vessel for mixing wine and water. 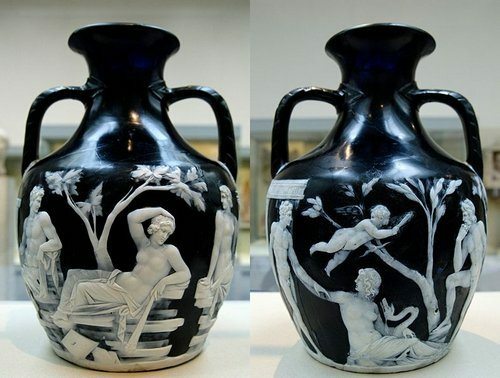 Wedgwood proved his human frailty by copying the vase from the catalogue not the original vase. How do we know? Well he repeated a mistake in the decorative frieze under the rim which was made by the engraver working on illustrations for the printer. It is the largest painted vase by Wedgwood in what he described as ‘encaustic’ decoration. Encaustic means a hot wax technique of applying colour developed in antiquity. 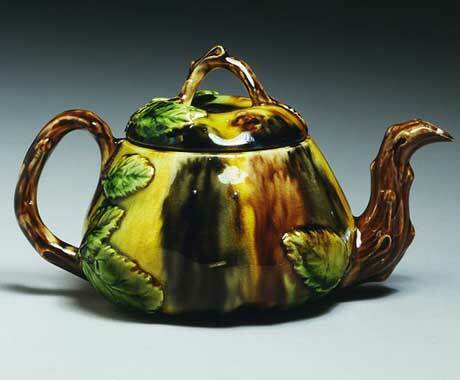 However Wedgwood’s encaustic decoration was hand-painted using a mixture of enamel pigments and a slip (mixture clay and water), which was fired on to the body. Technically Wedgwood’s vases were thrown in parts. The bowl was one part, the foot thrown separately and the handles moulded. They were then joined together with wet clay before firing. 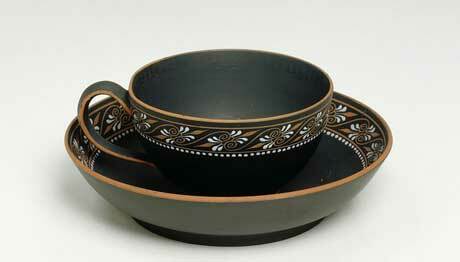 His incredible Black Basalt was a type of fine-grained stoneware that was impervious to liquid and very popular. Apart from his vases it was used for vessels for preparing and drinking Tea, which was both a fashionable and social drink during the 18th century. Tea was still very much a luxury item until 1784 when import duties were finally abolished. English tea drinkers preferred to drink their tea hot and with milk and sugar. 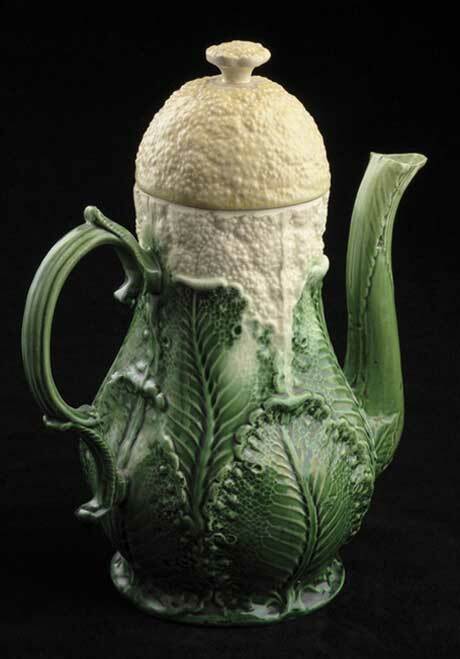 Designs for tea equipage were also affected by the fashion for fruit and vegetable forms, although the quality of modelling differed between makers. Designer Robert Hancock was responsible for many of the popular engravings that were transfer printed onto Wedgwood tea pots. Transfer printing onto ceramics was a process developed by 1753. It involved engraving onto a copper plate and then using ink prepared from a metallic oxide to brush the plate and then transfer the print onto paper while the pigment was still wet. It was then pressed onto the ceramic surface. Wedgwood developed so many different techniques of manufacture that it is beyond the scope of this piece to include them all. Notable are a beautiful variegated wares with a cream base colour whose surface streaking represented marble, agate and granite. 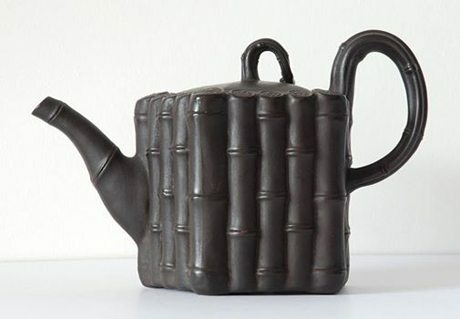 His terra cotta wares, cane wares, bamboo and chocolate coloured wares were all highly sought after, especially those with ‘black’ relief applied sculpture. 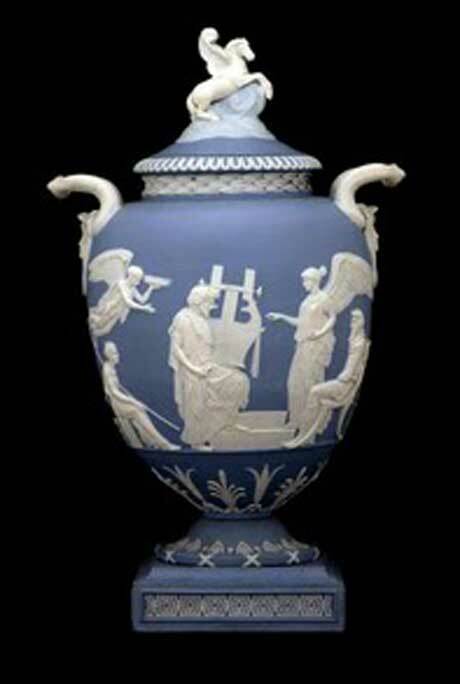 One of Josiah Wedgwood’s greatest commissions was to reproduce the so called Barberini Vase, named for the aristocratic Roman family from Barberino in the Else valley, who later settled in Florence and then moved to Rome, where they became wealthy and very powerful. The original vase was an outstanding example of Roman cameo-cut dark blue glass vase with white glass sculptural figures. It had been made about 40-30 BC and was one of the most celebrated antiquities in late eighteenth century Europe. Brought to England in by Sir William Hamilton, who had purchased it in 1778 through a Scottish art dealer he sold it by private sale to the 3rd Duke of Portland in 1784. 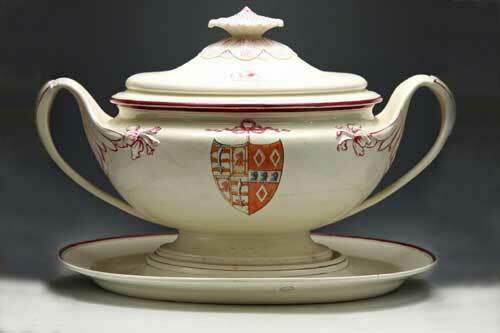 Portland took it Wedgwood for him to copy it so that he could display the copy and secure the original against harm. It took Wedgwood between three and four years to bring forth what artist Sir Joshua Reynolds observed as a ‘correct and faithful imitation’. 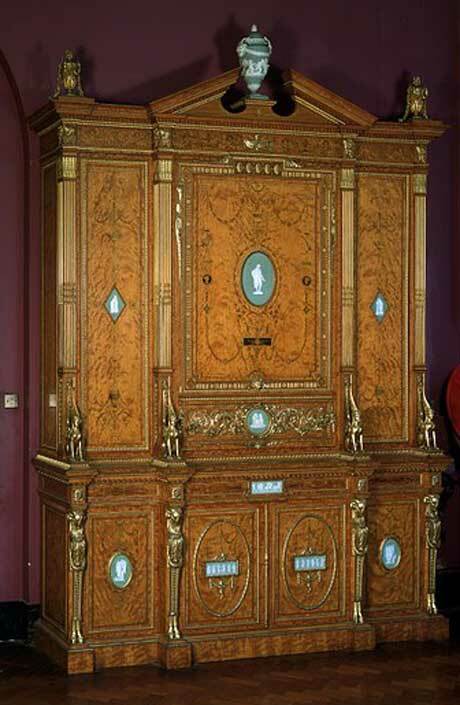 Josiah exhibited the vase in his London showrooms to the nobility and gentry who applied for admission tickets. Wedgwood’s ‘first edition’ copies number 45 made during the potter’s lifetime. 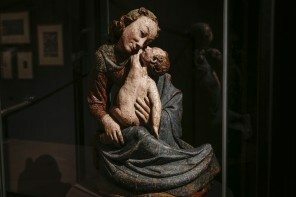 The original was then placed into the British Museum where its owner hoped it would be safe. Alas, after having been shattered by a madman it was put back together with the aid of Wedgwood’s wonderful copy, although until this century there were many shards left over. Taken apart for the third and final time in the 1980’s computers aided its complete restoration including all the remaining shards. The success of architect Robert Adam and the neo classical style depended as much on the new materials now available as on theory, and the early stirrings of the Industrial Revolution. Neoclassicism was never just a fleeting style or a label invented for the convenience of art historians. It was the culture of an age where men deliberately set out to rediscover the virtues of ancient classical art and architecture in such a manner the results are still relevant today. They studied the ancient Greeks avidly because they seemed to have always had an acute appreciation of the natural forces with which they were surrounded. Ancient Greek vases being found had decoration that recorded and celebrated the fertility of their vines and olive groves, the courage and skill of their mariners, the hardiness and steadfastness of mountain dwellers as well as the treasured gift of water from natural springs. 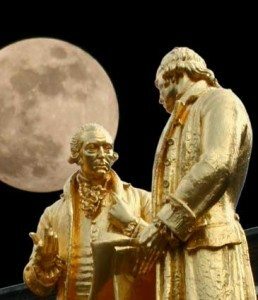 Josiah Wedgwood’s many moves and avid scientific curiosity won him a place in the pioneering Lunar Society, which was a circle of savants and inventors to which he belonged. They met at Birmingham during the full moon because the extra natural light it emanated made the journey home easier and safer for its members, in the absence of street lighting. The circle grew to become a society that included English physician, poet and theorist of evolution Erasmus Darwin (1731-1802), Scottish inventor and mechanical engineer of steam engine fame James Watt (1736 – 1819), the English manufacturer and business partner of Watt, the very savvy and successful Matthew Boulton (1728 – 1809), English theologian, philosopher and educator Joseph Priestly (1733 – 1804). The men of the Lunar Society were involved in the business of bringing together arts, design, manufactures and commerce. They were a highly influential and passionate group of tradesmen, tycoons, artists and artisans who successfully collaborated to fire up and fuel invention, evolution and help toward establishing the modern age. They sought to change the face of England with their efforts. They would discuss building canals, urging Parliament to build new roads to increase movement of trade to aid commerce and, putting in place systems for naming plants, gases and minerals. Wedgwood and his friends collectively contributed to making sure that England remained pre-eminent in trade and helped the expansion of her markets abroad. They were business men intent on helping to make the modern world. 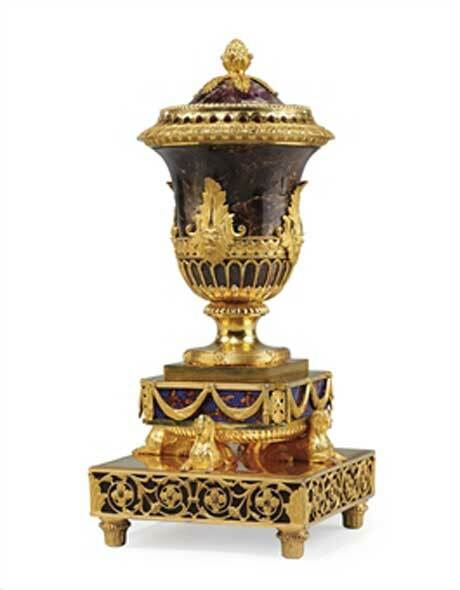 Our vessel by Matthew Boulton’s manufactory is a perfume vase, that also has tortoiseshell inset into its elaborate supporting plinth. At Soho in Birmingham Matthew Boulton employed some 700 or 800 persons where, by the end of the 1760’s, he was also producing a wide variety of silver and ormolu goods and producing many lamps and lanterns for Robert Adam. Wedgwood and Boulton both manufactured vases, albeit very different in size and style, which became popular due to the almost manic interest now in archaeology and the ancient world. Whereas Wedgwood was wedded to pottery and especially his new Jasper stoneware, Matthew Boulton made his vases out of an amazing material called Blue John which was mined at Derbyshire in England. It is a very rare semi precious mineral with distinctive defined bands of colour. He then surmounted them with wonderful ormolu, or bronze mounts that had been gilded using a method that adhered the gold with the use of mercury. 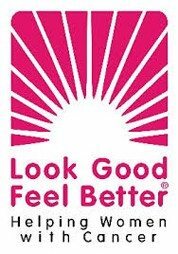 Due to exposure to the mercury many gilders died an early death. Birmingham entrepreneur and manufacturer Matthew Boulton and architect Robert Adam were amongst Josiah Wedgwood’ closest friends. 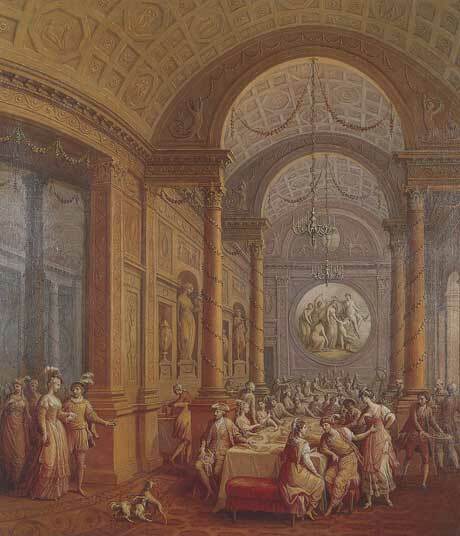 Boulton told his friend Mrs. Montagu in 1772 ‘since the present age distinguishes itself by adopting the most elegant ornaments of the most refined Grecian artists, I am satisfy’d in conforming thereto. In his interior design works Robert Adam would call upon Wedgwood for advice or to give him commissions, as did Boulton. Wedgwood’s outstanding wares included his invention of a very fine stone ware, which he perfected around 1775 and called Jasper after the original mineral mined in ancient times to make among other things, vases. 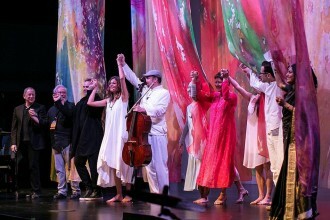 Ir was to be the material that made his fortune. Wedgwood Jasper vases have proved a fabulous investment for their owners with their enigmatic mythological scenes produced in high relief, in a pottery technique that his factory perfected. Jasper ware was produced when a passion for the antique had really reached fever pitch. A dense, hard stoneware he coloured it with metallic oxides. He then applied the classical ornament, usually in white so that it stood out in relief. 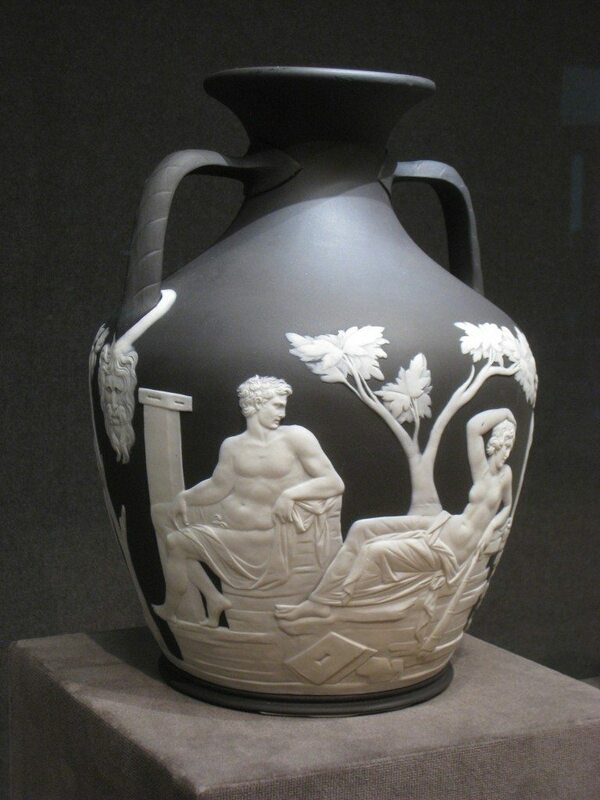 The earlier the vase by Wedgwood, the more outstanding are the relief sculptures, which is one way of dating them. He extended the colour range after 1780 to include light and dark blue, sage and olive green, lavendar and lilac, black and only very rarely yellow, which was next to red, one of England’s favourite colours for interior decoration, especially at that time. With its decoration in sharp relief set against the smooth blue surface the Pegasus Vase, named after its mythological subject was designed by the artist John Flaxman junior (1755-1826), who adapted a variety of classical sources. The figures in the main scene are based on an engraving of a Greek vase of the fourth century BC, while the Medusa heads at the base of the handles are taken from an engraving of an antique sandal. 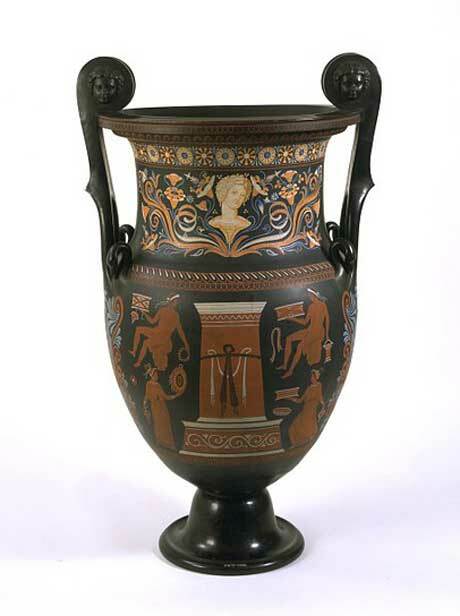 The vase is a masterpiece of the potter’s art and Wedgwood proudly presented it to the British Museum in 1786. 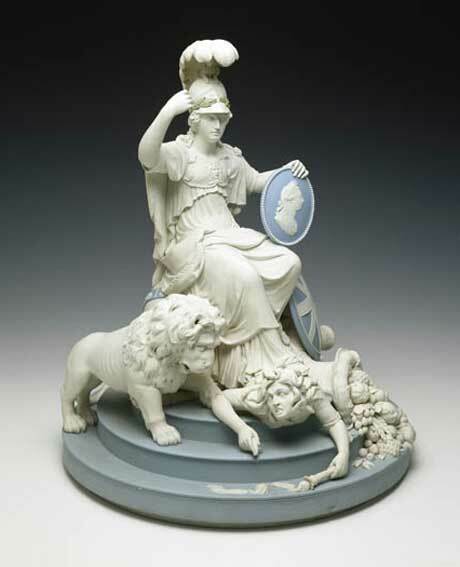 A talented pool of modelers included John Flaxman, who earned a name for himself while working for Wedgwood for 12 years producing statuary and portrait medallions made of Jasper. Then there were all manner of lovely little things made from Jasper. Delightful collectables such as bracelets, rings, etui cases, boxes, bell pulls, door handles and even buttons. Cut steel was an English specialty that was again pioneered by Matthew Boulton and James Watt that when combined them with blue and white jasperware by Wedgwood was a great success. Wedgwood even made a Chatelaine for fashion and style oriented hostesses to give to their housekeepers set by Messrs Boulton and Watt in ormolu or cut steel. Then there were chess sets, the opposing sides of blue and white with actors of the day as models for the pieces. 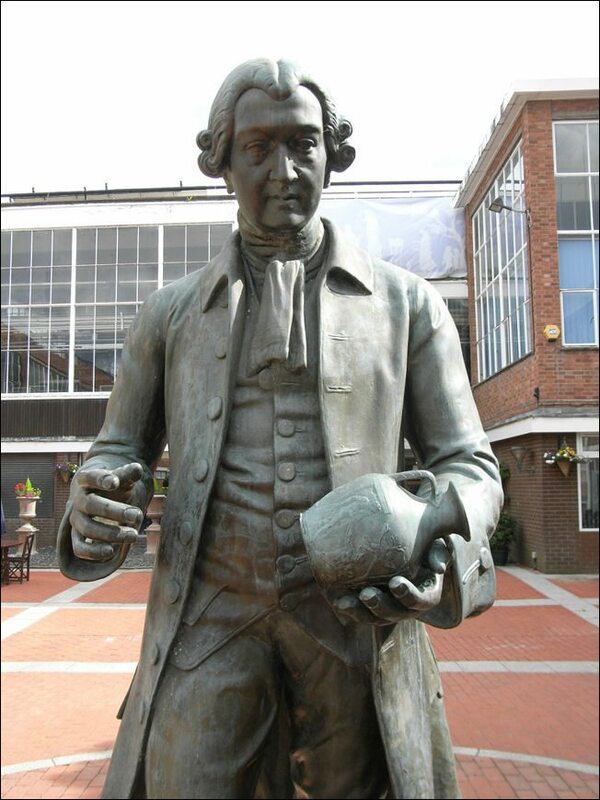 In the centuries following the founding of Wedgwood’s now famous pottery in Staffordshire, his name became an synonymous with the English institution that bore his name and it flowed over to benefit four generations of a family and their friends. H is, and his families achievements since his death in 1792, the same year his friend Robert Adam died, have passed into a rich social and cultural place in the fabric of English history and some might say have obtained almost legendary status. He would have been pleased to know I am sure a Museum of Wedgwood works had been set up in 1906 by the company that still bore his name. 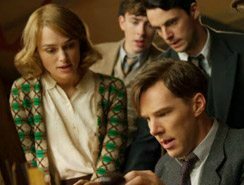 When they moved from Etruria to Barlaston in 1940 the collection went with them. 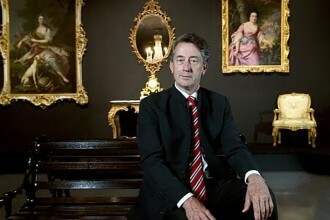 A recent victim of the global economic crisis in 2009 Wedgwood became part of an Ireland based luxury brands group that includes Waterford Crystal. Today the name Wedgwood is used as a generic term to describe the company’s products. The English factory has been reduced to only a handful of workers producing its high end goods, while all the rest of its manufacturing has been moved offshore to Indonesia. Josiah would find it difficult to conceive that the company he founded in a rural village in England had not only risen to such heights but also had then floundered under the weight of the whole world’s financial problems. At present the Wedgwood Trust is under Administration and the stunning new modernist Museum designed by Keith Murray and CS White, under threat unless a miracle happens to save it. It is still open daily while trustees hold discussions with stakeholders about how to preserve and ensure its survival. The canvas to paint the portrait, if you like, about Josiah Wedgwood is so wide and vividly coloured that it filled much more than a century and a half of English social life. The dinner service ordered by Edward Knight and his daughter Fanny would have fallen into Jane Austen’s idea of being “neat and simple” despite being ornamented with the Knight crest. Although Wedgwood’s Queen’s Ware, originally created in honour of Queen Charlotte the wife of George III bore her coat of arms during his lifetime Josiah Wedgwood was cautious about adding crests and coats of arms to his wares, fearing perhaps to be seen as over pretentious to his ever expanding middle class market. Order books at the Wedgwood Museum however prove that in the nineteenth century after his death all that changed and adding crests and coats of arms became more usual. This was as a result of the burgeoning China Trade, which enabled those wanting to appear gentrified to have them added and brought into England at a cost effective price. Josiah Wedgwood (1730 – 1795) fulfilled the dream, going from being an apprentice tradesman in a tough industry, to becoming a world famous tycoon. 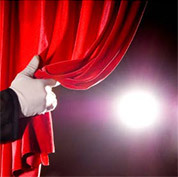 He was a trendssetter who built a business empire, founded a famous family dynasty and gained for himself a favourable reputation against all the odds and in harsh and physically demanding conditions. He was a man of his time and a man for all time.